What is China Building in the South China Sea? The South China Sea contains some of the planet’s most disputed territory. Six countries — China, Taiwan, Vietnam, Malaysia, the Philippines, and Brunei — are squaring off as they compete over the rights to the sea. The dispute centers on the contested Spratly Island Chain, a hodgepodge of small islands and submerged reefs which lie near the center of the South China Sea. All but Brunei have built military outposts in the Spratlys, and all of these countries minus China have built military airstrips on the islands. 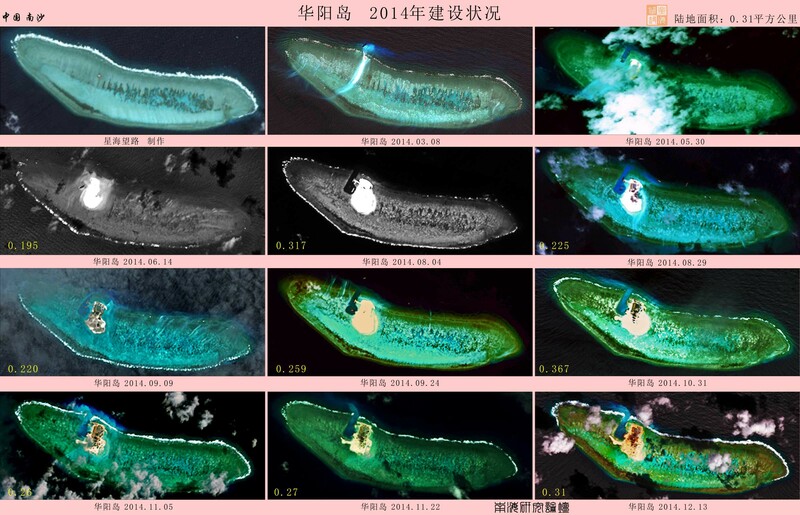 China, which arrived late to the Spratly land-grab, was left to occupy eight fully and semi-submerged reefs. With such little land to build upon, China has been playing catch up ever since. Over the past year, China’s Spratly outposts have been systematically undergoing a process known as “land reclamation,” where dedicated dredging vessels dig up sediment from the sea and dump it on top of submerged reefs to make islands. China has already built five islands through reclamation, and at least two additional islands are in the early stages of development. China is not the first claimant to reclaim land – Malaysia’s Swallow Reef and several Vietnamese islands have been artificially built or extended – but China’s reclamation efforts are operating at a larger scale than any previous project. Already, the artificial island built on Fiery Cross Reef has eclipsed Taiwan’s Taiping Island as the largest in the Spratly Chain, and buildings are under development on several other Chinese reefs. As their new military outposts become operational, it is imperative that we understand just what China is building in the South China Sea. Fiery Cross Reef (also known as Yongshu Island) was completely underwater until August 2014, when Chinese dredgers began to dig up the surrounding sediment. Before construction began, the Chinese presence consisted of a single concrete bunker on the reef’s southwest end, but this island has since become the largest in the Spratly chain, measuring nearly 2.3 km². The new island includes a nearly two-mile long strip of land that appears to be the future site of an airfield. Between November 2014 and January 2015, the southwest of the reef was reclaimed, connecting the airfield with the original concrete structure and enlarging the total land mass of the reef. Dredging activity has not ceased, and land is still being reclaimed. Recent photographs released by Philippine media show that foundations in development for a large scale construction project on the northeast of the island. Johnson South Reef has undergone one of the most extraordinary transformations of any Spratly feature. Photographs released by the Philippine Department of Foreign Affairs show that land reclamation began in early 2014, and new photographs indicate that reclamation is still ongoing. In early September 2014, nearly simultaneous reports released by IHS Janes and the BBC revealed the beginnings of a large construction project. It is unclear exactly when this construction began, but photographs taken in early December of 2014 clearly show a sizable building, possibly as high as ten stories, under construction on the newly developed island. The photographs taken and released by Vietnam’s Thanh Nien News agency show a number of construction sites under development, including what may be an air traffic control center. Philippine media has claimed that Johnson South Reef will one day contain an airstrip, but current photographs fail to backup this claim.The reef’s area is roughly 6 km², and the island itself is approximately .16 km², which leaves ample room for further reclamation. Cuarteron Reef is both China’s southernmost and westernmost outpost in the Spratly chain. Land reclamation on the reef appears to have started in March 2014. As of January 2015, China has built between .3 and .4 km² of new land. The newly built island is home to a seawall, a small military outpost, a helicopter pad, an artificial harbor, and a dock. Satellite photographs show ongoing construction projects, however photographs are not clear enough to make out what is being built. The Gaven Reefs are home to a mid-scale land reclamation project that has produced an artificial island approximately .08 km². Between June and August 2014, this island expanded from one small outpost into the buttressed island that exists today. Photos show that the new island contains barracks for construction workers and military personnel, shipping containers used as temporary shelters, an artificial harbor, and anti-aircraft weaponry. A report from IHS Janes indicates that this island contains both radar equipment and anti-ship guns. Land reclamation on Hughes Reef appears to have begun in March 2014. Satellite photographs suggest that construction is ongoing on the newly built island. Reports indicate that the new island is home to a lighthouse and a military outpost. Subi Reef, China’s northernmost outpost in the Spratlys, is the most recent subject of land reclamation. Satellite photographs from early February, 2015 show a significant presence of dredgers working two separate points on the southeast and the southwest of the reef. Dredging at Subi Reef first appeared in satellite photographs taken on January 26, 2015, which showed that two dredging ships had begun work on Subi Reef’s southwest end. Prior to the start of land reclamation, Subi reef contained a helicopter pad and a small concrete outpost used to house visiting troops. Mischief Reef is China’s easternmost outpost in the Spratly chain. Satellite photographs from the end of January indicate that land reclamation has just begun. These photographs show a presence of dredging vessels on the southern end of the island, as well as the addition of new land separate from an existing concrete structure. Mischief Reef is less than 200 miles from the Philippine island of Palawan (less than 150 miles from some points), thus putting the reef well within the Philippines’ Exclusive Economic Zone. Predictably, the start of reclamation at Mischief Reef has been met with significant protest from the Philippines. Eldad Reef is home to a naturally occurring teardrop-shaped sandbar on its north end. The sandbar’s size and shape remained consistent in photographs taken between January 2012 and November 2013. More recent photographs, show a slight increase in size of the sandbar, indicating that there may be a low-level reclamation project underway on Eldad reef. 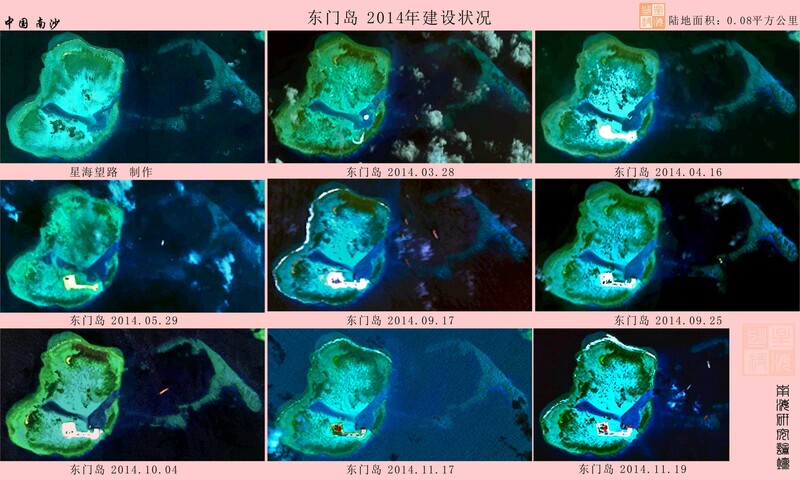 These photographs fail to capture dredging vessels and may simply be showing naturally occurring changes, however Philippine intelligence and media claim that Eldad Reef is in fact a current target of Chinese land reclamation. The situation on Eldad is ambiguous, and we should continue to watch the reef for signs of reclamation. Based on satellite photographs and intelligence reports, it is clear that China is currently reclaiming land on at least seven of its eight reefs — Fiery Cross, Johnson South, Gaven, Hughes, Cuarteron, Subi, and Mischief — and that reclamation may have also begun on Eldad Reef. Reclamation on Johnson South, Gaven, Hughes, and Cuarteron Reefs started in early 2014, reclamation of Fiery Cross Reef began in August 2014, and reclamation on Subi and Mischief Reefs started in late January 2015. Land reclamation on Eldad reef may have started in December 2014. Photographs indicate that massive construction projects are underway on the newly build islands at Fiery Cross and Johnson South Reefs, while less extensive but still serious construction is ondoing at Hughes, Gaven, and Cuarteron Reefs. Given the extent to which future control over the shipping lanes of the South China Sea will impact the global balance of power, China’s island construction is worthy of our attention. Ethan Rosen is a geopolitical researcher and analyst for China Six. His research focuses on the changing geopolitical situation between the Middle East and The Pacific. He is also the author of "The Bear, The Dragon, and the AK-47: How China, the United States, and radical Islamists conspired to defeat the Soviet Union in Afghanistan." I live half the year in the Philippines and am not biased in my views, just state what is obvious. Yes the Chinese have been Hoovering up fish and yes they probably want the projected Oil reserves, they certainly don’t care about the unspoilt beauty and wild life when they are Dredging and concreting Fragile reefs! The question all have avoided is had the Filippno’s (or anyone else),been fishing, dredging and building within China’s 200 no eez, what would China do? Fact is, that question would already have been answered.